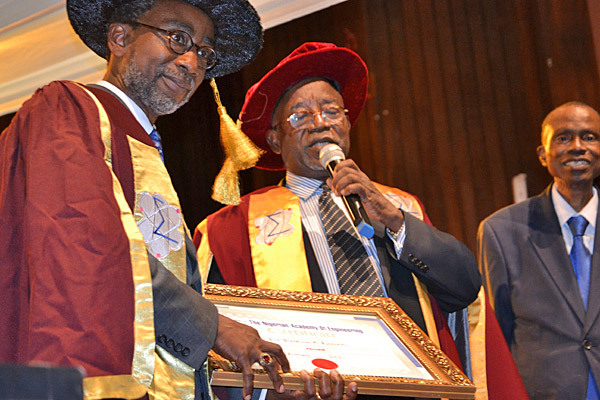 Babatunde A. Ogunnaike (left), interim dean of the College of Engineering, is welcomed to the Nigerian Academy of Engineering by Ayo Ogunye, president of the academy and his former undergraduate research professor. Babatunde A. Ogunnaike, interim dean of the College of Engineering, has been elected to the Nigerian Academy of Engineering. 8:59 a.m., July 6, 2012--Babatunde A. Ogunnaike, interim dean of the College of Engineering at the University of Delaware, is descended from a long line of Nigerian educators. In the 1930s, his grandfather on his mother’s side was the principal of one of the Teacher Training Colleges in Nigeria. His mother was an English teacher and in the 1950s, his father helped establish an effective education system for what eventually became Ogun State in the western region of Nigeria, ultimately serving as “inspector general of education” in charge of secondary education. “In the 1940s while still under British rule, the government of what would later become the western region of Nigeria, under the leadership of the late Obafemi Awolowo, decided to make education the cornerstone of the region,” Ogunnaike explained. Among them is Ogunnaike, who returned to his educational roots last month for his induction to the Nigerian Academy of Engineering’s 2012 Class of Fellows at the University of Lagos, his undergraduate alma mater. The academy, established in 1997, annually selects fellows from senior Nigerian engineering professionals living in Nigeria and abroad who have distinguished themselves in business, academia and government. The announcement followed Ogunnaike’s election to the National Academy of Engineers (NAE) in February for his contributions to advances in process systems, process engineering practice and systems engineering education. 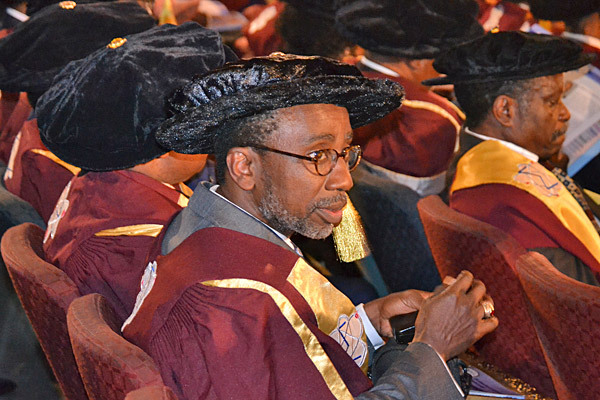 During the ceremony, Ogunnaike proudly stood alongside Ogbemi Omatete, his former undergraduate professor, and eight other inductees who were installed by Ayo Ogunye, president of the Nigerian Academy of Engineering. Coincidentally, Ogunye is also Ogunnaike’s former undergraduate research professor from Lagos. Ogunye said it was “a proud moment” to serve as the organization’s president while one of his former students was inducted. “It seems an almost eerie coincidence that the person who shook my hand when I was inducted into the academy is the man who once encouraged me to pursue my doctoral degree and led me to the United States,” remarked Ogunnaike. The second of eight children (many of whom are educators today), Ogunnaike earned a bachelor's degree in chemical engineering from the University of Lagos in Nigeria in 1976. He went on to pursue a master's degree in statistics and a doctorate in chemical engineering from the University of Wisconsin Madison in 1981. He returned to University of Lagos as assistant professor at from 1982-1988 before joining DuPont, where he enjoyed a successful 13-year research career while also serving as an adjunct professor at UD. In 2002, Ogunnaike joined the UD faculty full-time as a professor with dual appointments in the Department of Chemical and Biomolecular Engineering and the Delaware Biotechnology Institute’s Center for Systems Biology. Today he is William L. Friend Chair and interim dean of the College of Engineering. Ogunnaike said he knew early on in high school that he would ultimately become a teacher. “I would see students struggling and I would automatically look for ways to help them,” he said. “Whatever you do for yourself is gone when you are gone. What you do for others’ lives on forever,” he observed. At UD, Ogunnaike is committed to crafting engineering programs that are relevant to 21st century challenges. He continues to forge strong bonds with students, mentoring, advising and encouraging undergraduate, masters and doctoral students to pursue advanced degrees. His textbooks have been used to educate and train thousands of engineers in systems control and instrumentation at more than 29 universities. In many ways, being elected to the Nigerian Academy of Engineering brings Ogunnaike’s academic journey full circle, back to the place where his educational odyssey began. But for the teacher, it always comes back to the students. As his doctoral students graduate, he presents each student with an "academic tree" poster that delineates their heritage – beginning with the student, then Ogunnaike as his or her adviser, then Ogunnaike’s adviser (Harmon Ray), and on down the line in a succession of mentors in the academic lineage. The line includes famous names familiar to mathematicians, physicists and engineers, including Gottfried Leibniz (1646–1716), a German mathematician credited with inventing calculus. Some might say the poster is a legacy born of his upbringing; Ogunnaike conceded it is simply part of his genetic makeup. “That’s just the African in me,” he quipped.